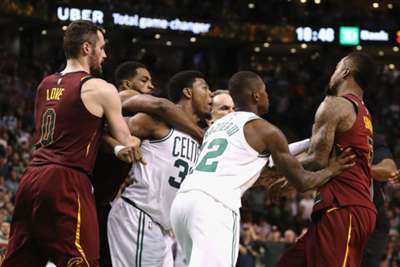 Boston Celtics star Marcus Smart and Cleveland Cavaliers guard JR Smith have both been fined by the NBA for their roles in a fight during a preseason game on Saturday. The pair were both issued technical fouls after Smith prompted a confrontation by shoving the Celtics' Aron Baynes in the first quarterbefore Smart responded by pushing his opponent in the back. Smart was also ejected. And both players have now been fined, with Smart docked $25,000 for escalating the incident, while Smith must pay $15,000. The Cavaliers won the game 113-102 as they look to bounce back from last season's NBA Finals defeat to the Golden State Warriors.